Generators come with different sizes and running wattages, but those most suitable for camping are the 2000W models. They work well with most camping appliances and provide enough energy for outdoor use. If you are still in a quandary for choosing one, take a look at this best 2000 watt generators for camping. I believe these 5 items below are the best items you could find. Honda EU2200i is the first product I want to review. I highly value its dependability as well as functionality when it comes to camping. This generator starts with the peak power of 2200W and maintains its performance at 1800 running watts. Basically, it provides enough power for camping appliances such as phones, RV coolers, lights and fans. If you want to handle energy-hungry devices or longer runtime, simply connect two identical models to double the overall performance. A 121cc Honda GXR120 engine supplies power for the generator. As far as I know, the GXR120 engine was initially made for heavy-duty models. That’s why you can totally count on the strength and sturdiness of this Honda motor. The engine has a low noise level, depending on the distance as well as workload. At full load, the machine creates 57 dBA of noise. The rating decreases as the workload reduces. It creates 48 dbA of noise level at 25% load. Some campsites ban loud operating generators because they disturb other campers. With this Honda EU2200i, you never have to worry about being kicked out of the campsite. Even if you camp in the wildness, having a quiet generator is also a smart decision. The EU2200i model features a 0.95-gallon fuel tank. However, this small-sized reservoir allows the generator to run up to 9.6 hours at 25% load. Compared to other models from Honda such as the EU2000i, it offers 10% added runtime. Plus, Honda EU2200i provides users with a shut-off valve. It allows the machine to turn off automatically when oil runs low. It also helps prevent problems from oil drain gutter and enhances the recoil effect. This inverter generator is one of the most lightweight products on the list. It weighs only 46.5 lbs. A handle is included, so that you can carry it around with ease. For camping freaks, the Honda EU2200i indeed brings a lot of values. Quality never comes cheap. I must admit that you have to invest quite a lot of money on this model. It is not a budget-friendly option. 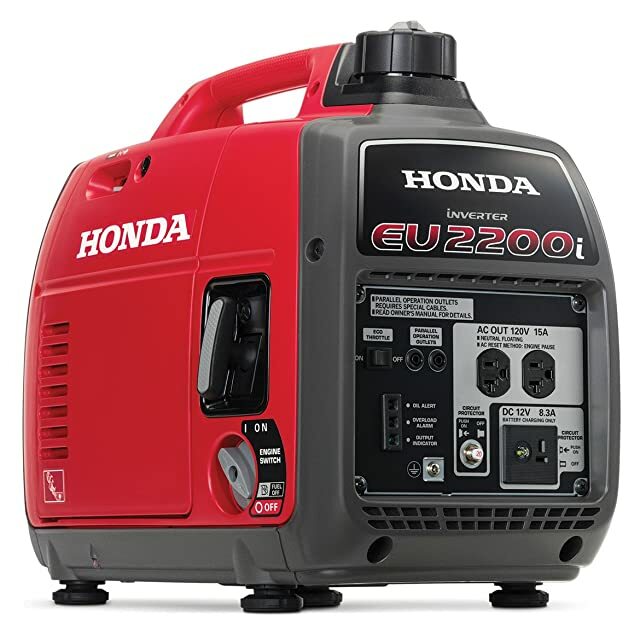 I highly recommend the Honda EU2200i for those who value its useful features and quality. Frequent campers will find this small-sized inverter a great companion. Briggs & Stratton has long been a significant manufacturer in the field of power equipment. Their 30651 model is an excellent result of over 100-year experience. The machine runs on a 111 cc OHV engine. It is small but tough. This Briggs & Stratton motor has always been famous for its fuel-efficiency. It consumes less oil & gas while producing a great amount of electricity. Compared to other models at the same price, it is much more economical. The 30651 starts at 2,200W and maintains a running wattage of 1700W. It handles well most camping appliances, even sensitive electrical devices such as smart phones or laptops. At the distance of 22 feet, this generator creates around 59dB of noise. It is as loud as a normal conversation. This makes the Briggs & Stratton 30651 the best match for camping and other outdoor activities. The machine features 1-gallon fuel tank, able to run continuously 8 hours at 25% load. It is not as impressive as the Honda EU2200i, but as for a small-sized generator, it is acceptable. You can find a parallel port in the control panel. This allows you to join two same generators together to maximize their power. When it comes to transportability, the 30651 is fairly bulky, but I am sure you will have no problem handling it. The model even includes an H-shaped handle, making it easier for two people to hoist and carry it around. On the downside, Californian can’t get their hands on the model. It is not CARB certified and can’t be sold in California. All in all, the Briggs & Stratton 30651 brings great bang for the buck. It is versatile, durable and handy for camping. 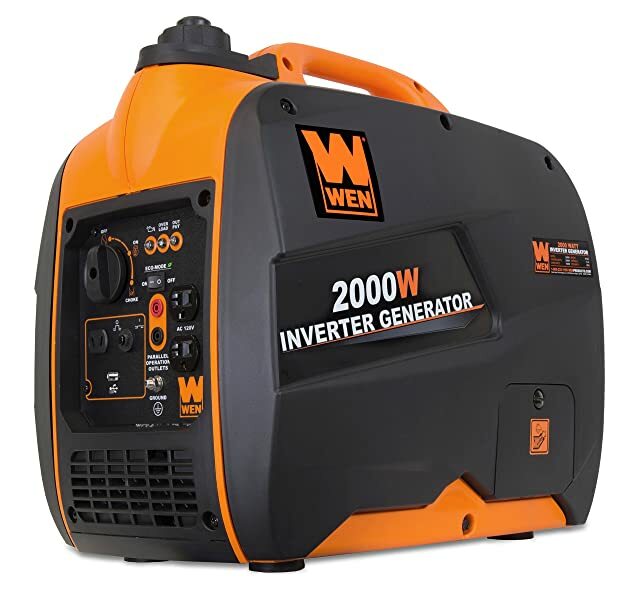 The last item in the section for inverter generators, I would like to introduce WEN 56200i Super Quiet. As the name suggests, this machine is famous for its noiseless operation. At the distance of 22 feet, it only generates 51 decibels. This noise level is equivalent as a normal conversation at home; therefore, no one will find this disturbing. If you want a quiet model for camping, the WEN 56200i is undoubtedly a great option. As for the motor, this generator adopts a 79.7 cc 4-stroke OHV engine. As you can see, it is not as strong as the two models above, but WEN makes sure that you don’t spend money on a fuel-hungry generator. It is, in fact, highly efficient. At 50%, Wen 56200i can run continuously for 6 hours. At 25%, the runtime is higher. 6 hours are indeed enough for you to charge your mobiles devices, light things up and cook. Wen 56200i starts at 2000W and continues operation at 1600W. This wattage allows the machine to handle most camping appliances, even those sensitive ones such as your smartphone. Regarding portability, this model is highly transportable. It is only 48 lbs and features a small handle. It doesn’t require much space to store. What’s more, WEN 56200i is EPA III, and CARB certified so that users can buy it almost everywhere in the US. When it comes to a suitable generator for camping, the Wen 56200i is a potential candidate. If all you need is a lightweight and quiet generator, you should go for this item. 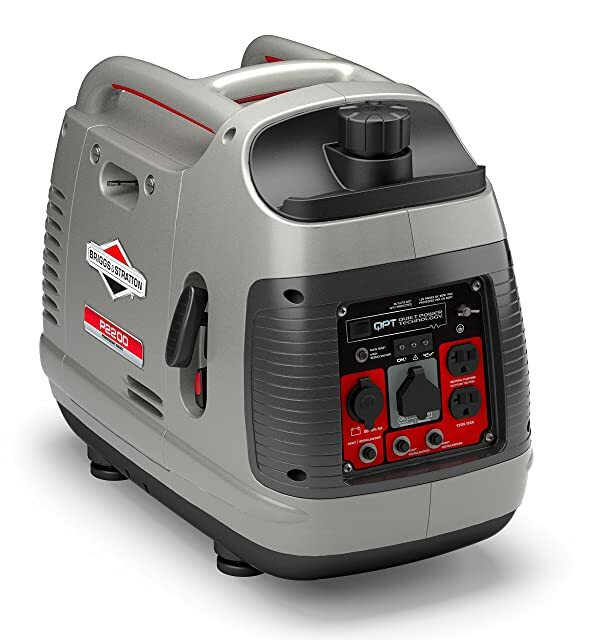 Featuring a 4-gallon fuel tank, this generator guarantees a long runtime, up to 20 hours at 50% load. At 25% load, this generator can function up to 26 hours. For those who want to use electricity overnight, this is a great option. The machine has 2500 starting watts and 2000 running watts. 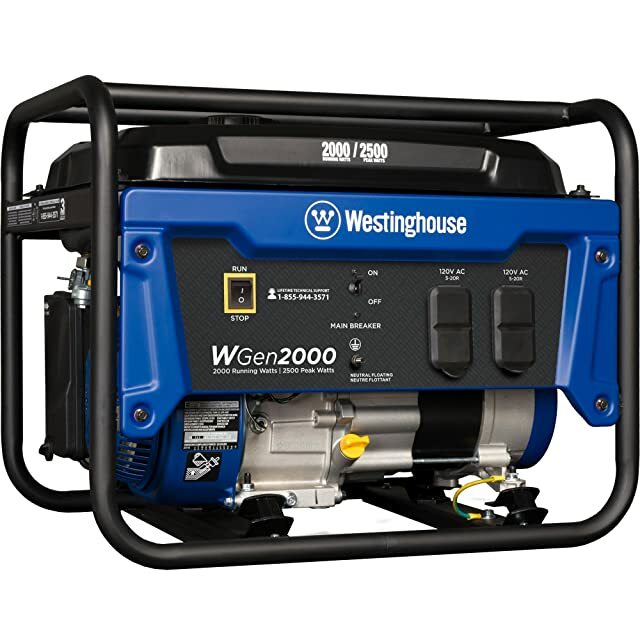 This rating means that the Westinghouse WGen2000 can handle many camping and household appliances as long as the total wattage doesn’t exceed 2000W. Westinghouse Wgen 2000 adopts a 212cc Westinghouse OHV engine. With this engine, the generator is highly fuel-efficient. It generates more power while consuming a moderate amount of gasoline. One thing I love about this model is that it is hushed. The noise level is not as low as those inverters above, but it is indeed at an acceptable level for camping. At 68 dBA, this generator meets most campsites’ noise requirement. This generator features both overload detection and low-oil shutoff features. It comes with a 3-year warranty. This product is also EPA, CSA, and CARB certified. There is one shortcoming though. Unlike what the name suggests, this generator is not very much portable. It weighs 90 lbs and features no wheels. If weight is not a big deal for you, the Westinghouse Wgen 2000 is undoubtedly a product of value for you. It offers long runtime, fuel-efficiency and many useful features for camping. 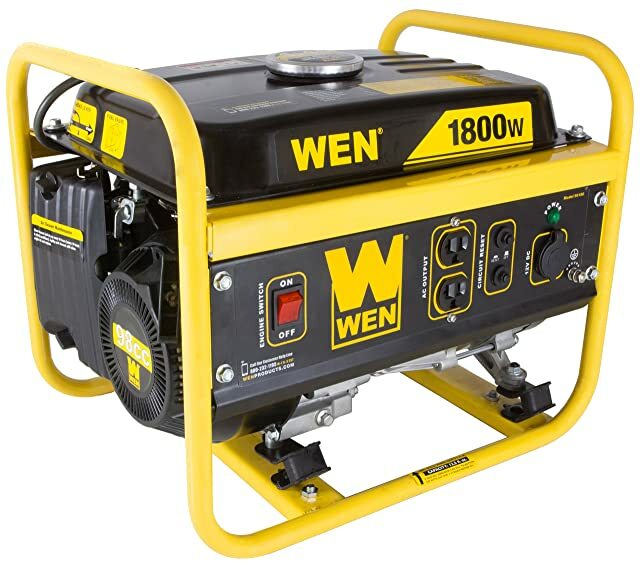 WEN 56180 is not really a 2000W generator, but it deserves a place in this list for numerous reasons. Conventional generators are famous for their affordability. This item isn’t exceptional. It is an excellent option for campers on a tight budget. WEN 56180 features a 98cc 4-stroke OHV engine. It is not the most robust one in the list, but it is fuel-efficient. With a tank of 1.1 gallons, the generator can run for nearly 8 hours at 50% load. For a small-sized tank, it is a long runtime. The engine is also very quiet. It generates roughly 65 dBA of noise level at 100% load. What’s more, it uses a cooling system and automatic shutoff. These two features protect the engine from overheating and damage. WEN 56180 starts at 1800W and continuously functions at 1500W. If you don’t want to run power-consuming devices for a long time, the wattage is enough for most camping appliances. One thing I also like about this generator is that it is very portable. With roughly 50 lbs of weight and two handles, you can easily haul this small buddy around the campsite. I think WEN should equip it with wheels to make the transport easier. On the downside, this item can’t function properly in cold temperature, so it may not be a good option for winter camping. You can buy it in all 50 states since it is EPAIII and CARB certified. All in all, I believe the WEN 56180 is a valuable investment. It is durable, affordable and versatile for camping and outdoor use. What can a 2000 watt generator power? Are you planning for your RV camping trip and looking for a suitable generator to bring with you? As you look at different pages, 2000-watt generators pop up as a suggestion. Now you start to wonder what can a 2000-watt generator power. 2000-watt generators are relatively small and not compatible with some household appliances. However, when it comes to camping ones, this type of generators can function pretty well. Most camping appliances are not energy-consuming. Some such as hot plate or microwave could ask for a running wattage of between 1500W to 2000W, but the rest will run well at 300W - 1000W. Take a look at this table to find out the running wattage of each camping items. As long as the running wattage of your appliances and the generator match and equal 2000W, the generator can handle them all. Remember that, the lower the load is, the longer the runtime will be. I also include both types of generators in my reviews. Some of you may wonder what makes them so different. Indeed a few factors distinguish the two types. Inverter generators adopt new technology of electronic circuitry and magnets. This allows the machines to convert AC voltage to DC ones back and forth. As a result, your appliances will get a constant flow of electricity. Especially for sensitive electronic devices such as smartphones or laptop, smooth and stable pure sin waves from inverter generators are beneficial. However, recent smartphones, tablets, and laptops also include the power protection system, so it is safe to use them with conventional generators as well..
Inverter generators are generally quiet. They use small yet highly efficient engines. Even though most of this type features relatively small fuel tanks, they can still offer a long runtime at 50% load. Packed with useful features, inverter generators often cost much more than conventional ones. Traditional generators exist long before their inverter counterparts. They often come with big fuel tanks, yielding much higher energy and longer runtime. Most conventional machines can function overnight, supplying enough power for your needs. Conventional generators can run on different energy types such as diesel, gasoline or propane. They are quite bulky, but most models feature handles and wheels to make transport easier. What’s more, this type of generators is affordable, suitable for users on a tight budget. Can generators be run in parallel? The answer is yes, but not every type. Unfortunately, conventional generators are not for running in parallel. Their counterparts, inverter types, can. Parallel generators allow you to enjoy a double amount of energy to run things like air conditioners or other advanced appliances. The trick is easy. You need to connect two inverter generators of the same type, and that’s it. Some of you may ask what the point of having parallel generators is. I don’t suggest you buy two identical generators so that you can join them together. But those who already have one inverter can easily purchase another item to yield more energy. 2000W generators are great options for camping. In case you don’t know which products you should buy, this list of the best 2000-watt generators for camping is what you need. I do hope that after reading it, you will find yourself a suitable model.